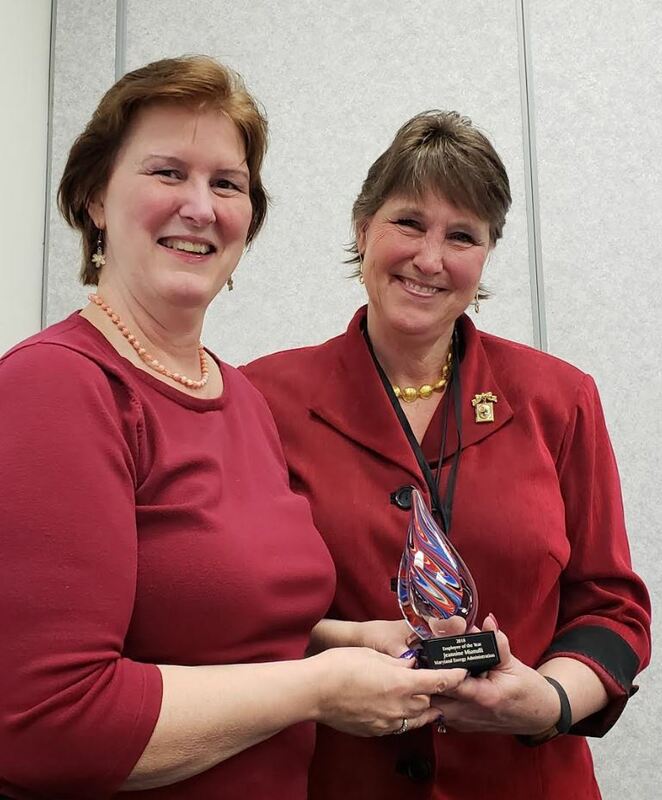 Maryland Energy Administration Director Mary Beth Tung presents Jeannine Mianulli with the 2018 Employee of the Year Award. 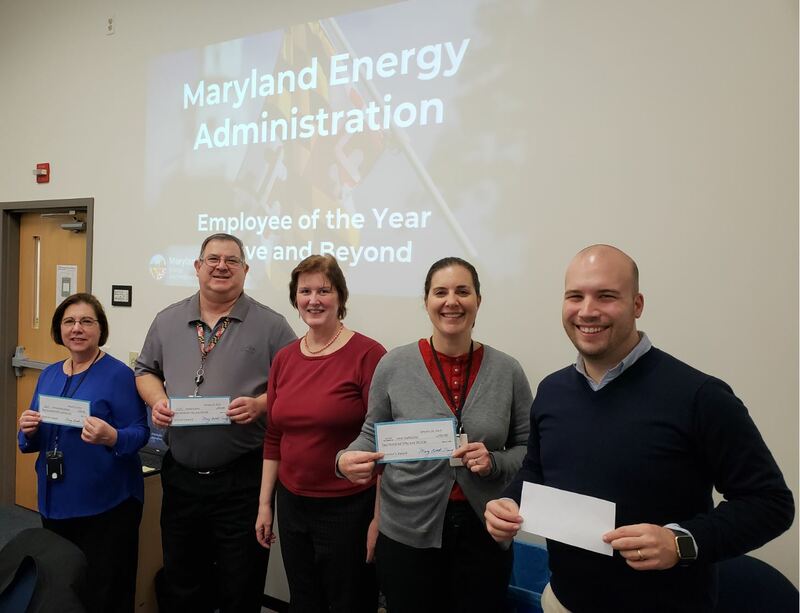 The Maryland Energy Administration (MEA) celebrated the winners of the 2018 and 2017 Director’s Awards this month. Rich Mallory is a member of the MEA program team and was awarded the first quarter Director’s Award. 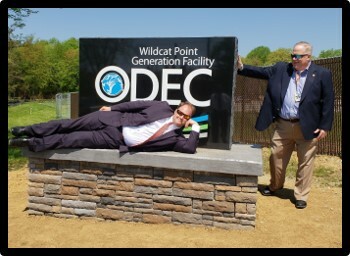 Rich worked diligently on the Maryland Gas Expansion Fund throughout 2018. Rich’s took lead representing Maryland in the Alta Gas and WGL merger which yielded $36,000,000 dollars to help bring natural gas to previously unserved areas of Maryland. He is an outstanding member of the MEA team who is dedicated, loyal and hardworking. His sense of humor and his wry wit makes him an excellent colleague and valuable member of our staff. 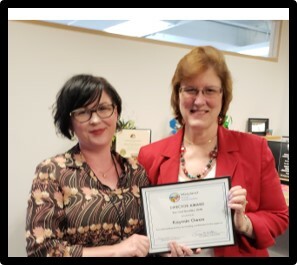 Kaymie Owen is a Communications Manager and was chosen as employee for the second quarter Director’s Award due to her work done planning and preparing MEA’s team for the annual MACO and the MML conferences. Our booth is constantly one of the best at each show which is reflective of her creativity and often draws many positive comments. The hours spent on these conferences are in addition to the many hours of her normal work week, which often includes writing press releases, informing the viewing public about our many programs and updating our social media sites. 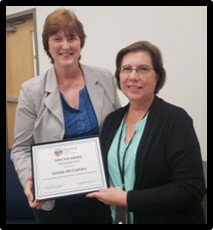 Denise McCoskery is the MEA Office Manager and was awarded the third quarter Director’s Award. Ever the consummate professional, Denise ensured the smooth running of all facets of the agency. The months of July through September are particularly hectic as the new fiscal year winds up and new requirements for the office come into play. 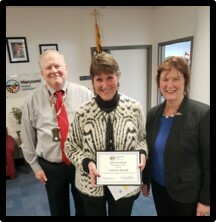 Denise ensured all facets continued to function despite the loss of the agency support services administrative assistant and other personnel disruptions. Whether in the area of office purchases, invoice processing, process orders for new phones, replacement IT and office equipment maintenance and replacement ensured functionality was not lost. Denise kept the office running during the acclimation of a Fiscal Officer and the two week absence of the Director. Fun Fact: Denise is the winner of the 2017 MEA Employee of the Year. Jeannine Mianulli is an indispensable member of the MEA administrative team and is the recipient of the fourth quarter Director’s Award. During the final quarter of the year, Jeannine is recognized for her individual efforts, though her daily phone exchanges with the public, to find solutions to the energy-related issues of the public. Through sheer perseverance with a touch of diplomacy, she was able to track down electric and fuel bill assistance through the maze of offices in Baltimore City, the Department of Human Services, and the Department of Housing and Development. Jeannine also provided critical demanding support during the prolonged absence of the Executive Assistant all the while continuing to maintain the Governor’s IQ System to a zero balance and to carry her FMIS related transactional workload. Whether it’s providing a pleasant helpful voice to callers or stepping in to assist her coworkers, Jeannie exemplifies the spirit of MEA. 2017 Director’s Award Winners from the left: Denise McCoskery, David Comis, Maryland Energy Administration Director Tung, Jenn Gallicchio, and Rory Spangler. Our 2017 recipients of the Director’s Award gathered for photo and to receive their financial rewards. All MEA Director’s Award recipient’s names are listed on a plaque in the MEA lobby.